In today’s podcast episode, I want to encourage you to create a course. Now, I know this sounds like it might be a bit overwhelming if you have never done it before, but trust me — you CAN do it. I’ve never created a course before either. If you look at this podcast and the blog, and now this free course I am working on, you might look at me and think — “Jon, you can do anything!”, but believe me, all of this is overwhelming to me. It’s just like eating an elephant one bite at a time, and together we can do this by breaking it down bit by bit. What we are going to do over the next few days is break it down into simple elements and steps to creating your online course. So let’s get started. Why do I need an online course? It’s very simple — you know stuff. I don’t care if you are a carpenter, a baker, a painter, or even a caterer — you do this professionally, so it means you know how to do something, right? People want to know how to do things, and since you already do this professionally, who better than to teach them than you?? 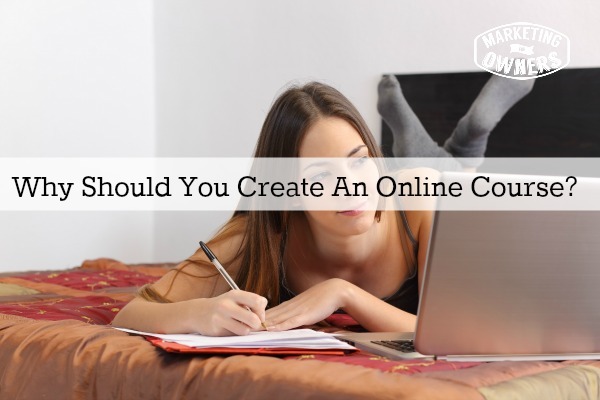 Your online course will help you generate leads and it will also help you sell something — so that is why it is important for you to learn how to create an online course. How much should I charge for my online course? For your online course, you have two choices when it comes to price — a paid version of your online course or a free version. For this podcast, we are going to assume we are all creating a free version (it’s more basic) because a paid version would be more enhanced. Later on, we will tackle the paid version in another podcast. The free version is going to be a lead generating product. Remember in our5 P’s of Modern Marketing P’s that we discussed before — #3 Permission? We want to get people’s permission to market to them. You will be surprised how easy it is to gather an email address from someone when you give them something of value that they were originally intent on paying for to begin with. In return for that free item, they will give you their email address, creating the perfect lead generating tool. As you start to send them the course, you can let them know that you will continue to send them things through email (and also let them know you will not be spamming them), and that they can unsubscribe at any time, because you are going to use a proper email provider. The paid version would be income — that’s the reason you created it — to make money! There are levels of in between, but right now let’s focus on just these two. The other day we talked about using an impact grid to help with your effectiveness when it comes to creating your online course, so for this, we are going to concentrate on the things that get results fast. We are not going to worry about the bits of things in between. We will come back to those at a later date. What type of course should I create? Ask yourself, “What can I do?” If you were a teacher or a professor at a university, you could teach whatever you wanted because that is what you are — a teacher. I cannot imagine myself teaching anything, so let’s move away from the term “teaching” and use the term “learning” instead. Have you learned anything? Have you ever employed anyone? Remember when your employer started on day one, someone had to show them the ropes right? Was it you? You taught them how to work in your industry — you taught and they learned. They needed to know how, so they listened to you because they were interested in learning your trade. You have taught and people have learned from you. Let’s say you are a cleaner and you possibly clean cars or houses for a living. You create a course that teaches people how to clean difficult stuff. They want to learn from you and you want to get the lead (for the possibility of a potential customer in the future) so you teach them how to clean. You could teach on subjects such as — how to detail a car from top to bottom, how to get the smell out of your closet, how to deep clean handles and doorknobs to get down in the nooks and crannies. Imagine creating a 7 part course on how to deep clean your refrigerator. People who want to really clean their homes or are interested in cleaning will look it up and subscribe so that they can learn how to do what you do. People want to learn from experts so if you put your course out there and teach them something, they will look at you as an expert in that field. Most of these people are not going to do it themselves, they want someone to do it for them, so if you capture the lead, you can teach them other things, they will see you as an expert in your field, and they will eventually call you to come and do the deep cleaning in their home or office. How should I style my online course? There are many styles to choose from. You have video, audio, blog posts, pdf’s podcasts, powerpoints, email courses, ebooks, and more. You have several options here as well. You have a 7 day course, once a day, drip fed, from a membership site, emails, once a day, a video linking them back to youtube that you send out every other day — the possibilities are endless. I don’t recommend sending out something once a week over a few weeks. That is too long and you will have customers losing interest if you take too long. If your online course is in video form, you can make them as long as you want — 2 minutes, 20 minutes, even an hour long. If you have customers who are willing to sit around for an hour and listen to you teach something, I would recommend you save that one for a paid course. How long will it take me to create this online course? If you want to know the answer to this one, you will have to tune in to the rest of the series this week to learn more about time management and how to go about creating the course itself! 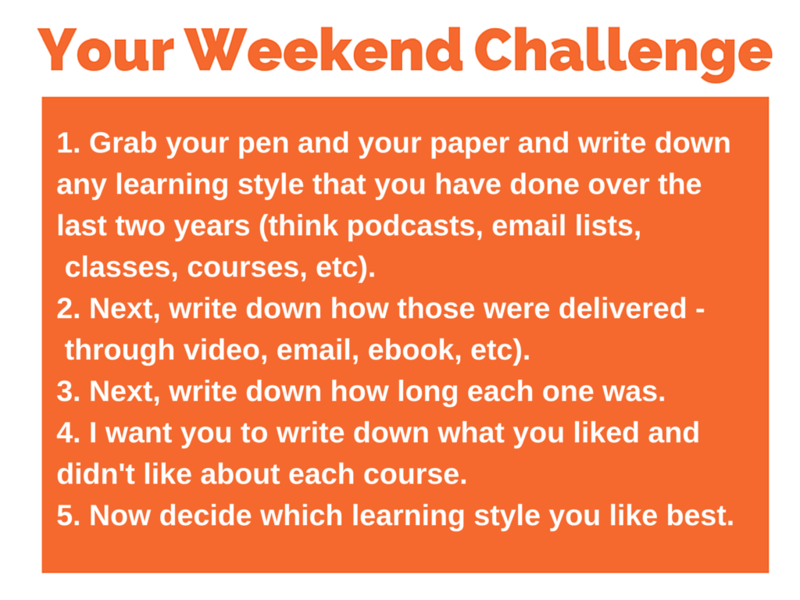 Being that this is Friday, it’s time to go over your Weekend Challenge. 1. 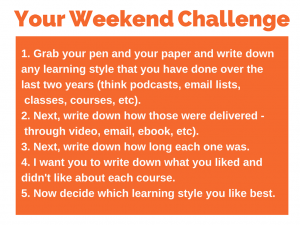 Grab your pen and your paper and I want you to write down any learning style that you have done over the last two years. This can be anything from podcasts that you have listened to (if you are listening here than you can write down Marketing For Owners), courses you have taken, emails you have subscribed to — write them all down. 2. Next, write down how those were delivered — did they come in the form of a video,email, ebook, etc. 3. Next, write down how long each one was. Did it stretch out over the course of 2-7 days, was it one video every day for five days — write it down. 4. Now, think about each learning style you have listed. Write down what you liked and did not like about each course, and be honest with yourself! You know how you like to learn something. 5. Now, decide which learning style you like best and decide if this is how you will deliver your own course that you are creating. Be sure to tune in on Monday as we continue our discussion on this topic. What kind of course would you create?